What Happens If Rain Season Causes Your Roof To Flood? Flooding is a serious and costly threat to commercial properties, and many areas experience extreme weather conditions that can lead to roof damage over time. What Happens If Your Roof Floods? If your roof becomes compromised, leaks can begin to develop and increase your risk of experiencing a flood. Understanding the factors that contribute to your risk helps you know what to do if the rain season causes your roof to flood. The best solution to a roof flood can only be applied after determining the exact cause. This depends on the specific construction and materials used for your building. Many building owners learn that their flood issues are a result of the materials used in their roofing system. For example, flashings or seams on your membrane can leak from wear and tear, extreme weather, or incorrect installation. These factors usually go undiscovered for some time. Having a professional inspect and evaluate your roof on a semi-annual or annual basis (especially after a season with a lot of snow that has melted or extreme cold weather which causes contractions and expansions) helps you determine the exact causes quickly, which will save you from more costly repairs in the future. Even after proper installation, there is no question that poor weather conditions can cause severe damage to your commercial roof. A professional service company should be called in to assess the underlying materials as these can become damaged and also lead to leakage. Broken or worn skylights or roof flashings are also common causes of leaking and should be checked often by your roofing company. In most cases, the exact causes are hard to locate as the sites of leak can often develop far away from the actual cause. Regular professional maintenance is essential to the integrity of your roof as well as to maintain your warranty. Having an inspection gives you an opportunity to have a skilled expert examine all areas of your roof. 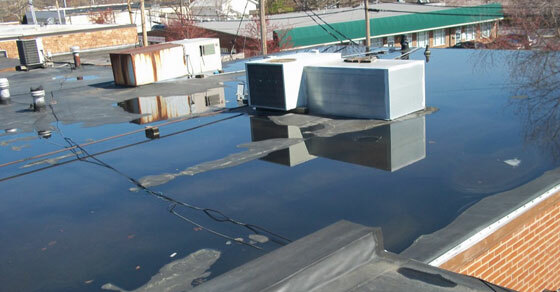 Many flat commercial roofing systems begin to deteriorate rapidly within 15 to 20 years after installation, resulting in leaks and different moisture issues. Your roofing company can easily uncover any damage or material loss. This is a valuable preventive measure that prevents more extensive damage to your commercial property. If your commercial building has a flat roof that is not draining properly, water may start to collect if the broken drainage system is not fixed quickly. Blocked drainage is one of the most common causes for roof flooding and leakages. The collected water can add considerable strain to the roofing system, causing roof leaks and possible flooding of your interior. The contractor will assess the roof drains, scuppers, gutters, and downspouts to clear the way for rainwater to flow freely off of the roof. If the existing drainage system is severely damaged and cannot direct the water properly, a little repair may be necessary. Roof leakages typically occur at the internal parapet walls or at the external edges of the roof, where flashings have been installed to prevent damage to the ends of the roof membrane cover. But if the flashing is poorly installed, damaged or becomes loose because of storms or winds, the edges of the roof cover can become exposed, allowing water and moisture to get past the roofing system and into the building. Tears and breakages of the roof flashings are not unusual, considering the constant expansion and contraction of roofing systems as temperatures change from season to season. Damage to the flashings can cause deterioration of the entire roofing system, so they should be monitored for damage and fixed in a timely manner. Penetrations include drains, pipes, gas lines hot stacks, vents, conduits, HVAC units, and other objects that pass through the roof’s membrane. By their nature, all penetrations are susceptible to leaks, and should be properly secured to prevent water damage to the roofing system. The roofing contractor should thoroughly assess each and every penetration on the roof to ensure that they are prone to leaks. Roof penetrations can be kept water-tight with pipe boots, rain collars, pitch pans, field wraps, and flashing. Ageing of the roofing membrane can make the material susceptible to cracking, shrinkage, splitting, puncturing, and blistering, allowing water and moisture to pass through. Damage to the roofing membrane can also expose the roof’s insulation underneath. The main function of the roof membrane is to keep water from getting inside the building. So, it is critical that this membrane be in good condition to prevent commercial roof leaks. If the roofing company is able to identify damaged membrane in time, they can repair it and avoid a costly full-scale replacement. Some cases may require you to have the materials replaced completely, as with severe damage to the roofing membrane. If so, you need to make sure that the new materials and roofing systems are installed correctly. Re-installing an incorrectly applied roofing system can be expensive and time-consuming. The Spring season creates a dangerous environment on your roof as snow is melting. Professional roofing companies ensure the highest level of safety for their workers and the occupants inside the buildings as well as the integrity of the roof. This ensures that you get the best results with minimal risk of injury or damage. You can also have the materials and work warrantied to provide you with an additional level of protection from future roof flooding. For more information, or to have your roof evaluated, contact our team today.